Since the Holiday Season is in full swing, I think it is important to talk about how students travel to and from Charlottesville for the holidays. This is a particularly important issue if you are an out-of-state student like myself and are trying to keep costs low. There are a number of ways one can get into and out of Cville, each with its own merits. 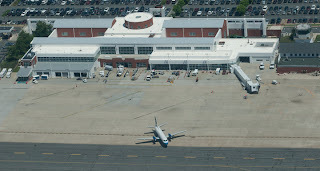 in arriving for a flight out, it would be this efficient airport in our wonderful city of Cville! The most exhilarating route, in my opinion, is flying into Washington, DC. From DC, students can take a short Amtrak train ride into Charlottesville. 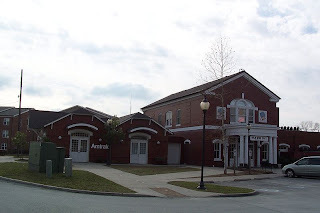 The inexpensive ride cuts through the rolling Virginia countryside, passes through several small towns, and drops off very close to Grounds at Cville’s Union Station (see photo). Though the train doesn’t leave from Platform nine and three-quarters, I always feel rather Harry Potter-esque taking the train back to school. Lastly, many out-of-state students (and most in-state students, of course!) drive to and from Charlottesville. Though the drive from Houston is too grueling to make for just a holiday break, my friends from as far south as Atlanta and as far north as Connecticut can easily make the drive in one day. One of the stranger adjustments of going to college is only being ‘home for the Holidays,’ but fortunately there are many ways you can get there and back! Choosing a Major – How About Computer Science? When I first came to UVA, I had no idea what I wanted to study. The first few classes I took were completely unrelated, ranging from Astronomy and German to Computer Science and Psychology. Honestly, I was a bit intimidated – it seemed like so many people came here knowing exactly what they wanted to do, and could pretty much plan out their schedule for the rest of college. With time though, it’s not hard to figure out what’s the right fit for you. A few weeks into the semester, I was really enjoying my Introduction to Programming class with Professor Jim Cohoon (if you’re at all interested in Computer Science and don’t have any prior programming experience, I highly recommend his course!). Something seemed to click, and I knew that Computer Science could be the right major for me. Which brings me to the main focus of this post: the wonderful Computer Science program we have at the University. There are two main ways one can major in Computer Science – either through the School of Engineering and Applied Sciences, or through the College of Arts and Sciences. One of the major distinctions between Computer Science in the College and in the School of Engineering and Applied Sciences is that one graduates with a BA in the College, and a BS in the E-School. There are some differences between the two programs, but since I’m in the College of Arts and Sciences I’m going to talk about that major. Computer Science is one of the newer majors in the College; the first graduates of the program were in 2007. After a student has taken at least one introductory programming class, he or she may declare the major – there are five core courses, four computing electives, and four integration electives. The integration electives required by the BA are (in my opinion) the biggest difference between the BS; the electives allow students to take classes which apply computer science in many other departments (such as Music, Media Studies, Drama, Philosophy, Biology, and Psychology). 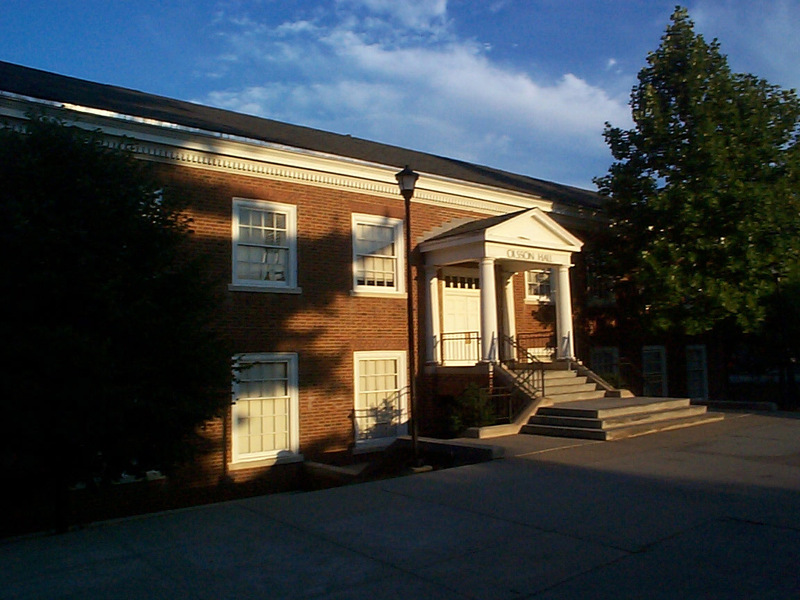 Right now, the Computer Science department is housed in Olsson Hall, but UVA is constructing a new building directly to the right of it – which means a brand new facility for future Computer Science majors! One of the best parts about majoring in Computer Science is that the degree is incredibly flexible; if you choose to major in it, you’re not going to be stuck in a cubicle programming and doing software development for the rest of your life. Many consulting companies hire CS majors if that’s what you want to go into, and that’s just the start of job opportunities. (Also a side note: the average starting salary of a UVA Computer Science graduate is around $60,000 a year – so there’s a lot of money in the field too). Like any transition, moving to college prompts many questions. How hard will the work be? How much food will I eat? How long do I have to live with this roommate? Coming from Virginia, I knew a good amount of people going to UVA and although I wasn’t the most outgoing, I wasn’t extremely shy either. So, it wasn’t until the first morning of class when I stepped foot in the dining hall that the daunting question surfaced: how will I make friends? Sure, for the first and even the second week, everyone’s in the same boat. On the street, at the gym, and in class, you say hi to anyone you recognize: the people in your class, your hall or suitemates, maybe some people from orientation. You might even exchange numbers. But come the third week, everyone’s settling in. Cliques aren’t necessarily established, but people have begun making memories with one another, whether it was over an insane frat party, a midnight game of Basketball or a 2:30 a.m. fire drill. Not excepting you. You have a Friday night buddy system, you’ve joined an intramural team, and you’ve even hosted a dance party with your hall. But here you stand, glass of cranberry juice in one hand, your plate of stir-fry in the other, alone. You my friend, yes you, have become a victim of the first year. “Why me?” you wonder. You’ve scanned every table for a familiar face and already rejected the to-go box. Two choices: Sam, whose constant stream of drip sweat is sure to spoil your appetite and those hotties you and your friends were gushing about earlier only to find they were right behind you; somehow, it doesn’t seem so funny anymore. No, don’t even reach for your cell phone; fake texting is lame. But hear, hear! Literally, listen! Sound #3: Not big on asking questions? Music, baby! All of the dining halls play music, from John Mayer to Kenny Chesney to Led Zeppelin. If you know a song start singing. I’m glad I did. Going through the yogurt line, I picked up singing, “If only my life was more like 1983….” The guy next to me joined in, and a full show choir erupted! No, not literally. But a fellow John Mayer fan, I asked to sit with him and my first morning was spent with 8 other guys I wouldn’t have met otherwise. In conclusion, there are many scheduled, organized ways to make friends, but you have to take advantages of other less obvious opportunities. If not, sit with Sam Stinker and stomach the stench; he or she is probably an athlete, and with a little deodorant, might make a good running buddy! Or sit with the cuties you were gushing about; you have four years, so best reclaim your dignity now! If all else fails, try to remember the face of the last person you saw eating alone in the dining hall. You can’t and no one else will either. It’s easy to get caught up in your own life at UVa. Between your classes, your activities, your friends, and potentially a job and/or significant other, things can get hectic. And I’ll be honest—I’ve gotten lost in the “I’m too busy” mindset and unfortunately, sometimes not explored all that UVa has to offer. But this weekend, the opportunity to escape my “bubble” presented itself and I jumped on it—and am so glad I did. To my surprise, not only did I have an unforgettable experience, but it also made me realize something about myself. Here’s what happened: My good friend Katie from dorms (and ironically, from South Florida—who knew!) 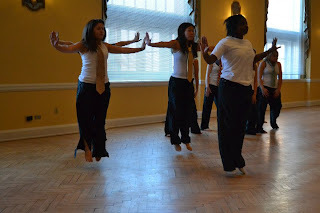 casually invited me to her UDC (University Dance Club) fall performance when we ran into each other the other day. She told me the details (she was just in the third dance of many, and I could leave after that) and said if I was free to stop by, she’d love for me to come. I figured it would be fun to surprise Katie, as she wasn’t expecting me to actually come. I had fully intended just to stay for those three dances—after all, the reason I was going was to see Katie dance and it was Sunday aka “catch-up-on-all-of-your-work”-day—and work, as usual, was plentiful. After arriving in Newcomb, I found a seat, but as soon as the first dance started—to my surprise—I immediately got up and went to stand up behind the seats—I wanted to get the best view possible! The energy in the room was incredible. I even got the chills. Katie wasn’t on stage yet, but I was already loving it. Needless to say, I was completely caught off guard by my reaction. When Katie came on, it was awesome to see her strut her stuff, just as I had expected. But what I didn’t see coming: I stayed for the entire show! My automatic reaction after the third dance ended was “Time to go crank out that problem set!” But I stopped myself. This is part of why I’m here, too. Although it’s easy to forget, it’s important to not just participate in your involvements. From older students and graduates, I’ve been told numerous times that part of why college is so great is that you have the opportunity to grow and learn in your experiences, by going outside your comfort zone and seeing what’s out there. And as I was reminded this weekend, it’s amazing what happens when you’re spontaneous! Going to the UDC concert reminded me of how rewarding that can be and how great a place UVa is, as there is so much going on here to explore. And then it dawned on me, as I scheduled for classes next semester. This applies to academics, too. I scheduled myself to take three math and two commerce classes? Probably a good idea to round out that schedule a bit—I did want somewhat of a liberal arts experience, after all! Art history? Another psych class? Only time will tell. But I do know that I want at least one out-of-my-element class each semester. My social psych and advanced econ class have both been extremely gratifying, and arguably up there with my favorites. Shocking, I know. (I smell a future post on this). 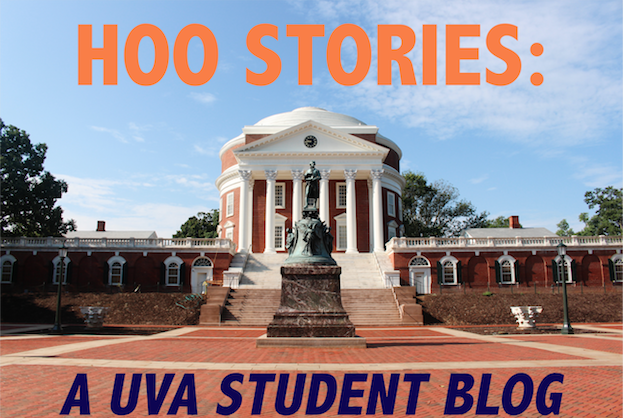 Coming into UVA, one of the most exciting things was always the amount of clubs offered. I have always been a girl to enjoy a lot of extracurriculars and hence appreciate the selection here a lot. One of the clubs that I am most fond of is Virginia Skydivers. The club's regular by-comers are all experienced divers, except for me, because I just joined. Although costly, skydiving is very well worth it. First tandem jumps cost $255, but with the UVA student discount it's $225. A tandem jump is a type of skydiving in which you are strapped onto an instructor and the parachute is attached to the instructor's harness. There's some training before you make this first jump, but most first-jumps are tandem jumps. This is the first baby step of skydiving! Once you dive more and eventually get licensed if you wish, prices for jumps significantly decrease. Usually at least one person in the club goes out every weekend. We have two regular locations, Orange, VA and West Point, VA. A lot of times, people can just come out and watch too. It's a really fun time to go out and just watch people sway down from the sky and witness it in person. It's a really different atmosphere out there. In addition to just jumping, we also have a handful of fun events we attend! We do other things, such as base jumping, jumping from hot air balloons, wind tunnels, and recently the club attended the infamous skydivers' Halloween Boogie at West Point, VA. There was a casa, in which 30+ jumpers use a tailgate exit, magic carpet rides where divers just hold on tight to each other, hoop dives through hula hoops, raft dives, and etc, as seen in these pictures! We meet every Thursday at the Backyard, which is off of Elliewood on the Corner, at 7PM. These meetings are always very relaxed and chill, talk about skydiving, fundraising ideas and other things. I make it out there by foot from Old Dorms, so I know you can make it too! Fundraising is a big priority right now, because we want to make skydiving more affordable for college students, but to do so we need help! Please try and come out sometime and we'll assure you have a blast! And here is some really cool footage of CavMan diving into Scott Stadium when we played Eastern Michigan! I can't say that the club sponsored CavMan, but cool nonetheless. Along the lines of something a superhero once said... flying is statistically still safer than driving! Check out our site http://www.student.virginia.edu/skydive/index.php! Logical or not, the one thing I swore I'd never do was join a fraternity or sorority. Nothing against those who do, it just didn't seem like my kind of scene. I wouldn't say that I like the quiet life, but I do enjoy a varied life, and everything I saw of fraternities and sororities screamed repetitive--not to mention indoors. Well, three years in and wouldn't irony love the fact that I'm part of a fraternity. Well, I suppose it's only mostly ironic. See, we say fraternity/ sorority as if there's only one kind, but there are several. Each branch has its own distinct personality, and recognizing that, I stand by my original decision not to join a social fraternity; it's just not my treat. APO is not a social fraternity but a service fraternity, and in the eyes of UVa, a CIO. The focus is on helping people rather than knowing people and building connections. The core principles of APO are leadership, friendship, and service, and members of the group seek to exemplify these values in their daily lives as well as through their service. Every Saturday, the group gets up bright and early to visit various sites throughout Charlottesville and Albemarle to help Free Paint Projects, Quest, Loaves and Fishes, the Lewis and Clark Center, and many others. From a purely practical standpoint, members learn a lot about painting, sanding, building, and planning, but the main focus is on improving and being involved in the community. Every semester the incoming pledges put on a large scale service project for the communities of Charlottesville and Albemarle. They choose it and plan it based mainly on the principles of need and permanence. Then they execute it along with current brothers and graduated brothers who can make the trip back. Past projects include the Skate Park at McIntire and the renovations at Greenbrier Elementary School. To be clear, APO does not haze; not only would it be against APO's charter, but it would also violate UVa's own policies on the matter. APO also does not use any of its fraternity money (pledge dues, brother fees, etc.) to purchase alcohol. Again, the focus is on service, so our money goes to buying things like tools and paint and paying National Chapter dues. If you have any questions about fraternity/sorority life, or social, service, and honor fraternities, please feel free to email me. I won't pretend to be an expert on the subject, but what I can't answer, I can surely direct you closer to the person who can. Welcome future wahoos! I’m so happy you have stumbled upon our blog so that we can give you a glimpse of what life at The University is all about! I think my fellow bloggers will agree with me when I say UVA is a magical place. There’s something here for everyone, and it is impossible not to fall in love with Mr. Jefferson’s school. I know I have! A quick introduction: my name is Ellen Haick, and I am a second-year completely undecided about my major (on most days I fluctuate between English, economics, and religious studies- today I am determined to do it all!). I am a Southern girl, born and bred, hailing from Jackson, Mississippi. Moving to Virginia was quite the transition, but has been an experience I wouldn’t trade for the world. 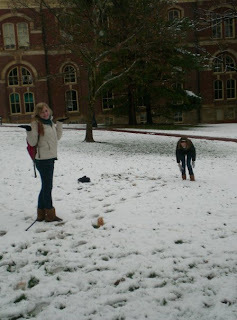 There’s nothing like playing in your first real snow (see the picture of two Southern girls trying to master the art of snowball fights), attending your first field hockey game, or realizing that Nova is actually an area of Virginia, not another state that you somehow missed in your second grade geography class. UVA has become an essential part of who I am. Outside of classes, I am involved with Reformed University Fellowship (RUF), my sorority, volunteer tutoring through Madison House, and copy-editing for V Magazine. Charlottesville and UVA has so much to offer, I feel like I discover something new everyday! One of the best organizations I have joined is the wonderful staff of V Magazine. 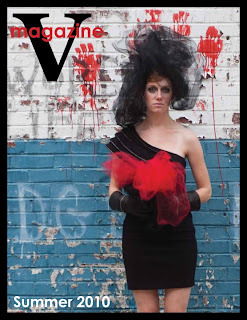 V Mag is just one of UVA’s many awesome publications. We strive to bring fashion and culture to the university, covering everything from events on-grounds to little known attractions throughout Charlottesville. Check out these shots of last issue’s cover. In my opinion, the coolest thing about the magazine is that, like most organizations on-grounds, it is entirely student run. Our staff, writers, photographers, and models, are all members of a very talented student body. Once a week, we all get together to touch base and make sure the publication runs on schedule, and to enjoy pizza and each other’s company and creativity. My job as copy editor allows me to interact with all the writers and be a part of marketing the magazine to the rest of the school. I love putting the finishing touches on great pieces and seeing all our hard work come together. I feel truly blessed to be a part of such a wonderful and creative organization. Next time you are near grounds, look for our upcoming issue! Stay up to date with our newly launched Facebook page (http://www.facebook.com/pages/V-Magazine/132469706798597?ref=ts). V Magazine embodies a diverse and inspiring student body- a student body I hope you prospective students will one day join!